I really love it when customers come back for more orders. And I love it when they challenge me. Well, I say I love it now, but sometimes I sit wondering how I am going to create something and stare into space for prolonged periods before a light bulb goes off in my head! Customer Elizabeth had ordered frames for her children and then asked to make a frame for a wedding present. You know one of those events that you are told no presents but you know you want to get something?! Elizabeth had said that the bride and groom are keen mountain climbers and in fact, their wedding was in a mountain area somewhere. You can see in the photos the finished piece. 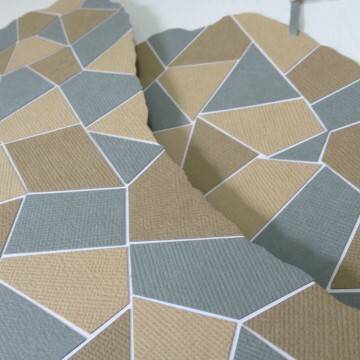 Two mountains made from papers in a mosaic like format. This was easier said than done. I have done mosaics before and the gap between the tiles is never consistent (well for me it wasn’t!) But with the papers, I wanted to ensure they all had the gaps evenly spaced so that involved a lot more time with cutting the papers perfectly. 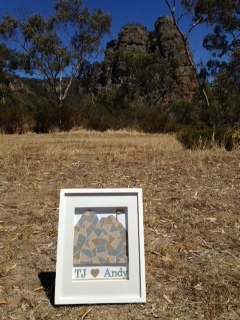 The flag that is on the mountain (which is a little hard to see in photo) was the wedding date for T.J and Andy. I was really happy to hear that it was loved by all. I was also extremely happy to have the above photo emailed to me after the wedding. Can you believe Elizabeth made a special effort to capture the frame in front of the mountains? I thought that was amazing and I am so grateful for her sending it through. I am so lucky to have such wonderful customers. ← Inspired by my darling niece.